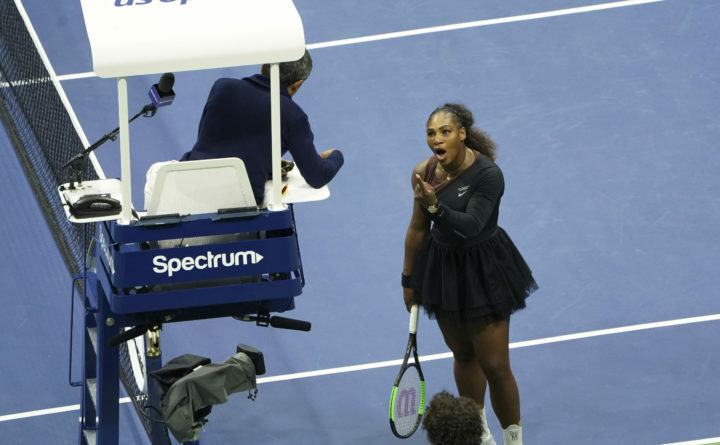 Serena Williams argues with the chair umpire during a Saturday match against Naomi Osaka of Japan during the women's finals of the U.S. Open tennis tournament at the USTA Billie Jean King National Tennis Center in New York. NEW YORK — Naomi Osaka walked to the net, the excitement of being a Grand Slam champion mixed with a bit of sadness. The way Williams lost, of course, was what stood out most in the match. The arguments with chair umpire Carlos Ramos and the three code violations. On Sunday, a day after the match, the tournament referee’s office docked Williams $10,000 for “verbal abuse” of chair umpire Carlos Ramos, $4,000 for being warned for coaching and $3,000 for breaking her racket. Associated Press writer Brian Mahoney contributed to this report.